Their stay was coming to a close. The trio spent one of the last evenings camping, together with Peter’s new friend Lilah. Erica tried to get to know the girl as much as possible, she didn’t want her little brother getting hurt again. She couldn’t really fault Lilah though. The girl was active and cheerful, and she wanted to make sure that everything she did she did perfectly. Truth was, Peter liked Lilah a lot. 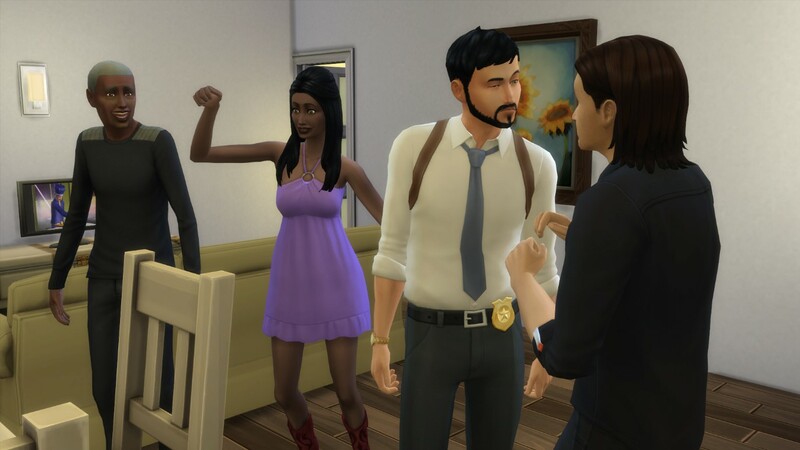 Naturally he spent his last day in granite Falls with her. She made everything seem so bright and so easy. Peter admired how she just picked up everything and moved to Granite Falls without knowing anyone there. When she talked about all the places she’s seen, it made his imagination run wild. She was only two years older than him, how was it possible she’s already seen and done so much? He wanted to hold on to at least a little piece of her, so he took a picture with her. It might well be all that he’ll have left once the holiday is over. That, and the memories, of course. They said their goodbyes and promised to stay in touch. Only time will tell if they can keep their promise. 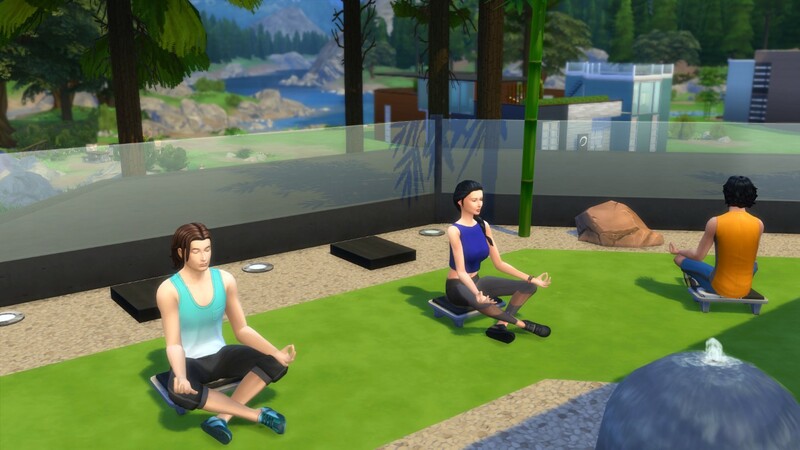 In any case, it was high time for them to return back to Newcrest. Only the twins were at home to welcome them, everyone else was at work. They all went inside and set around the dinner table. Peter felt uneasy, he was worried about his sister. If things were still wrong now, how was his father going to react to Erica’s pregnancy? Peter and Erica looked at her, confused. Ruby arrived from work just a few minutes later. She seemed to be muttering something to herself. Erica rushed to her. The women hugged each other tightly. The holiday was continuing in a pretty similar fashion that it started in. The honeymooners were honeymooning, and I was spending a fair amount of time on my own. At least the place had a pretty good book selection for me to distract myself. Most of the time I was pretty bored though. The two of them were being particularly mushy one day, so I headed to one of the spas on my own. …but then I saw that the yoga instructor was the most beautiful girl I’ve ever seen. Yoga it is! Her name was Lilah, and she was actually rather good at the whole instructor thing. Though the exercises were way harder than what she made them look like! I really really wanted to impress her, so I gave it my best. I mean, I was literally bending over backwards for her! After the lesson, I went to over to thank her for the great session (my back was aching already). …and this. I need ear plugs. Finally, the morning came. Lilah looked even prettier than I remembered when I met her. She led me to this small wooden tower which was meant to have a good view of the waterfall. We checked out its’ wildlife exhibit at the bottom floor first. I need to tell Erica about this waterfall, she’d probably love to paint it. If she can detach herself from Dan’s face for a moment, that is. So I told her about how my family is working on building up Newcrest from the ground and about the places my dad and my granddad have already created. She said it sounded interesting. We spent the rest of the evening playing horseshoes. Of course, she was way better at it than me. I hope she wasn’t too disappointed that there was not that much to see in Newcrest yet, and that I managed to make it sound interesting enough. I would love for her to visit. Author’s Note: I’m trying out something a bit different; the following 2 honeymoon instalments are going to be narrated entirely by Peter. Also, I didn’t build the house Peter, Erica and Daniel are staying in, it’s one of the awesome creations by TheSimSupply called Digging Down. We arrived at our accommodation in Granite Falls at dusk. Erica and Dan were being all mushy and newlyweddy during the entire journey. A part of me regrets saying yes to this already. But hey, at least I’ll get to see somewhere new, right? My room is pretty small, but it will do for the duration of the trip. We arrived pretty late, so I decided to go straight to sleep. Since my sister’s room was just next to mine, I can tell you that the newlyweds most definitely did NOT go straight to sleep though. Eww. The following morning, we were all pretty pumped to go out to explore Granite Falls. There’s a bunch of spa type buildings in the area for all the tourists – I hear they’re all really new, so we might be one of the first ones to try them out. Sweet! Erica and Dan went to get a romantic couple’s massage or something. For obvious reasons, I didn’t feel like joining, though from what I saw I could swear the massage therapist was perving over my sister… so gross. I went to sit by the pool of the spa and enjoy the view of the lake. Well, at least I tried to. There were so many pesky flies around I had to retreat back indoors. Man, I wish I could be playing games on my computer back at home! Erica seemed impressed with the whole massage deal, so I decided to give it a go too. Let’s just say it’s not really my thing! Needless to say I didn’t stick around to watch the sunset with them… I’ve never tried fishing before, it’s kind of relaxing! Maybe I could incorporate it in my Captain Duckhorse game somehow! Didn’t see Erica and Dan for the rest of the evening, but I’m sure I can imagine what kinds of things they got up to… not that I would want to! I walked home on my own around midnight. While it was kind of weird to be tagging along for my sister’s honeymoon, I must admit the nature in this place is beautiful. And you can actually see the stars! It was too late though, and we had to go through with the lesson. Dan was actually pretty good at it – maybe it’s his insane side. Me and Erica were pretty wobbly to be honest. She was pretty determined to make it work though! Personally, I just decided to do my own thing. When we got home in the evening, we all went to try out the hot tub. And, you guessed it… they just started making out AGAIN. Why the plum did I think it would be a good idea to join them again? He sat up on his bed quickly. Melody was gone. Gone forever. Instead, his sister and her dubious boyfriend were in the room. Erica tells Ruby next, over breakfast. Nobody notices that Isaac’s entered the room. Without even thinking, Isaac dashes towards Daniel. Isaac has no more words left. Erica faints as soon as the fight starts. Isaac wins the fight, he is in excellent shape, after all. Ruby takes the young couple outside. Ruby smiles. Her life and death had taught her that sometimes, you can’t change the events around you, and the best you can do is think outside the box. Erica goes inside to chat to her brother before leaving. Erica doesn’t understand: “What’s going on Petey? Peter’s heart might be broken, but we still have a birthday party to throw. The Perrins are here, of course, and so is Daniel. Erica figured he could use the opportunity to impress her father. Meanwhile, the dastardly twins are bonding with evil cousin Cassiel. Erica blows out the candles and only has one wish – for her father to accept her boyfriend. 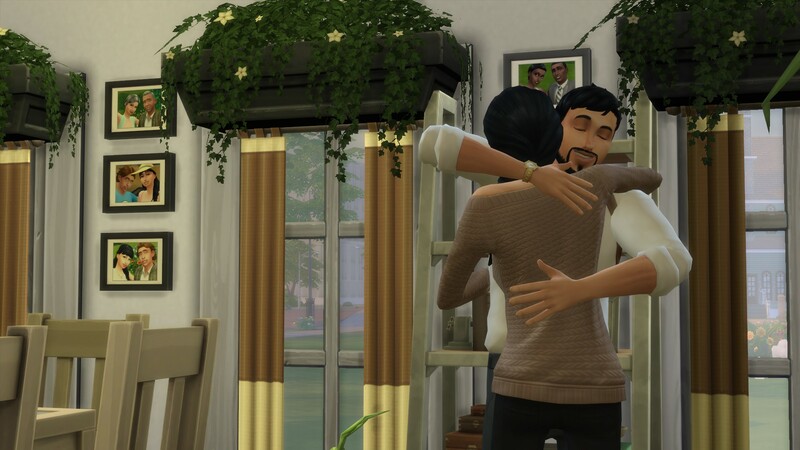 Since the challenge allows me to pick the third trait, I pick family-oriented for Erica – she’s always been so great with her siblings I feel like she should have had that trait a long time ago. Poor Jaxen. He’s just too nice for the girls in this town. Erica and Daniel spend most of their evening in the garden, away from Isaac’s anger. This may be a good time to mention that the third trait Daniel gained upon turning into a young adult is insane. And just like that, they get married in the backyard. Isaac has been pretty busy at work, and even arrested Daniel’s mom, with the help of valuable witnesses, such us… the reaper. (I was so tempted to arrest Grim instead, but he did not even vaguely match the suspect description). Finding out that Daniel’s mother was a criminal did not help Isaac like him any better, but he was pretty pleased she was locked up and even cracked a joke with his creepy looking coworkers. Looking at the trio, I finally admitted to myself that the tache is just not working for Isaac, and opted for way more facial hair. It’s birthday time… which can only mean one thing. The twins are now teenagers! 4 teens under one roof… oh boy! Isaac sits knows he can’t put the talk off any further, so he sits them all down. Isaac: “As you all know, our family is not quite like any other family in Newcrest. We have obligations, and our duty is to build this place up from the ground. Your grandfather has created the park you all love so much, and my generation’s duty has been building an affordable neighbourhood where some of you will end up starting your own families. But the legacy must move on, and there is so much to be built… so there has to be an heir. I love you all equally, and I wish each and every one of you could be the one to carry on the family’s name, but that can’t be the case. 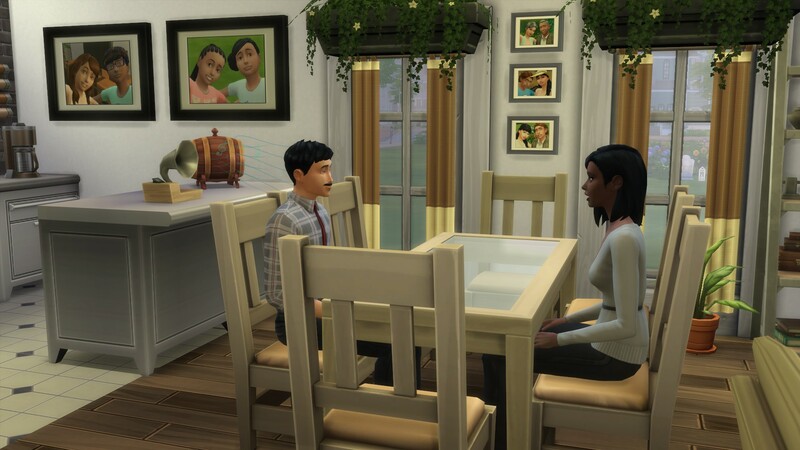 To be as fair as possible, and to ensure the best for our town of Newcrest, me and your mother have come to the conclusion that the best way to determine the heir would be what each of you would like to build. The one that comes up with the idea that will be the most useful for the community will become the heir. Erica lets out a giggle. Everyone bursts into a fit of laughter. The twins look at each other for a moment. Oh, yes, that miniscule detail. Not only did both of the twins inherit Isaac’s mean trait upon transitioning into teenagers, but they also both got deviance aspirations, making them both dastardly as well. Yikes! 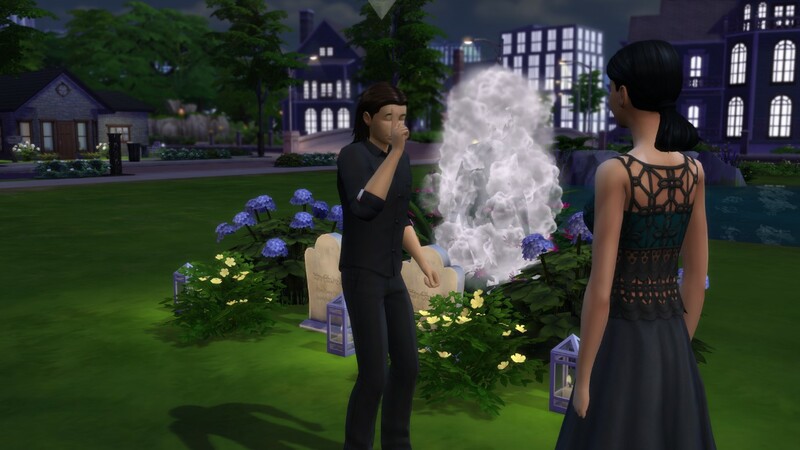 I feel like this was caused by my benign neglect during their childhood – I mainly left them to their own devices while focusing on Erica and Peter… grave mistake, it turns out! Isaac bursts into a fit of hysterical laughter… or is he crying? Of course, school finishes a lot sooner than Ruby and Isaac’s work does. And Daniel comes over just like he promised yesterday. The answer is too soon. Ruby and Erica can hear the yelling all the way to the living room. Isaac joins the two at the table. Erica wants to be a million miles away. I’m still debating whether to keep Isaac’s tache… I was hoping it’ll make him seem more detectivey, but in reality he looks more like Mario… Sigh. After a fair amount of convincing, Peter got Erica to get dressed and go outside with him. While she was still feeling blue, she did appreciate that her brother was trying to help her get her mind of Daniel. There was only one slight problem with the plan… Daniel. That’s easy for you to say Peter, there’s plethora lovely ladies in town. The male selection… not so much. 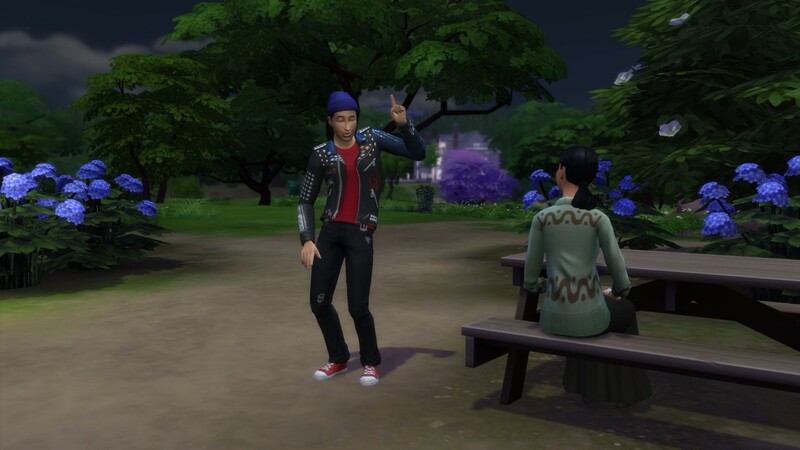 To prove his point about the fish in the sea, Peter heads to the bar section of the park in a search for new sims. Peter is temporarily stunned and unable to produce any coherent words. A cute and cool looking girl wants to speak to him? Erica retreats to the bench to give her brother a bit of privacy with the new girl. But she doesn’t stay alone for long. I think she likes him too. Meanwhile, Erica bonded with Daniel. They talked about his troubled childhood, and his ambitions of becoming a famous musician one day (he should consult Peter for potential band names, that’s for sure). Erica knew it was getting late, and that she had to say goodbye. Except that she didn’t want to let go. So she went for a kiss instead. And Daniel kissed her back. She suddenly forgot all about having to go home and spent hours kissing him, although it only felt like minutes. Erica dashes off home. Her legs feel so light as she’s running and her heart is singing. She couldn’t wait to paint what she was feeling. They recounted their evening to each other, full of excitement. Daniel: “Oh, uh, I was just checking out the graves in your back yard. You don’t see that often! Erica’s heart starts beating faster and faster… could he be saying what she thinks he is? Suddenly, a stylish looking girl with short hair joins them. She covers her mouth… has she actually said it out loud? Erica is mortified. Please let this be over already! Phoebe and Daniel start laughing while Erica just wishes she could dig herself a hole in the ground. How could everything go so horribly wrong all of the sudden? Phoebe: “Anyways, as fun it was to meet you we gotta get going. Got stuff to do, don’t we Dan?” She winks. Erica just stands still as they walk off. Phoebe looks at Daniel and giggles. Erica stumbled into her room. She can barely see through the tears and all she wants to do is to hide under her bed sheets and cry. But she’s been working all her life to defeat her gloomy trait and she’s determined not to let it get the best of her now. She goes downstairs to talk to her mom instead. I’m testing the moustache look on Isaac. I was going for Magnum PI, but Isaac is no Tom Selleck and the taches in The Sims 4 leave a lot to be desired. I have yet to decide if Isaac can pull this off. Ruby seems to think he can! Yes, I get it Erica, you want love in your life. Sigh. Why don’t you give Jaxen a chance? He’s a nice boy… and by the looks of it, the only boy around. Perhaps the two of you could head out together and explore if we can manufacture that spark for you? It’s that or being lovelorn, take your pick! It appears there is one other teenage boy in the neighbourhood after all. Meet Daniel Agustin. He even looks like a bit of a bad boy, just like Erica wanted. As soon as she sees him, she forgets all about poor Jaxen. It’s going to be hard for Erica to get his attention though, with so much competition around! He passes by on his own a little while later. Quick Erica, say something, anything! The two get talking and Erica learns Daniel is not only creative, but also a music lover. 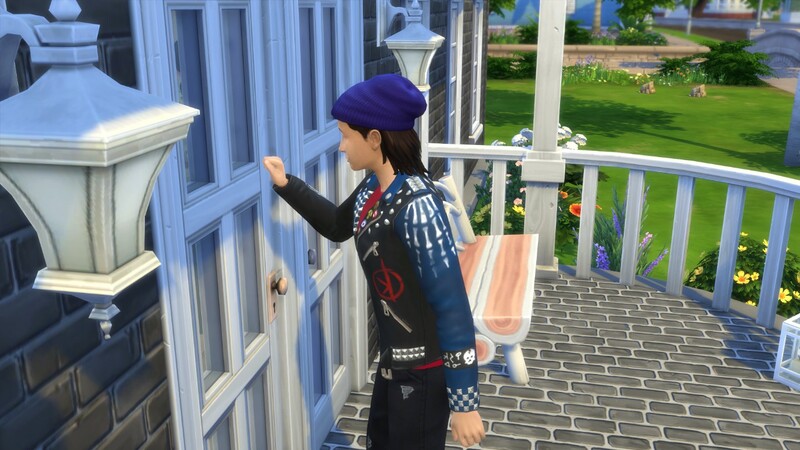 On top of that, I have a bit of a sneak peak in CAS and it turns out he’s also dastardly. If that’s not Erica’s artistic stranger with a bad boy edge, no one is! Cousin Cassiel! What are you doing here all alone in the middle of the night? It’s Ruby’s birthday, she’s finally becoming an adult! 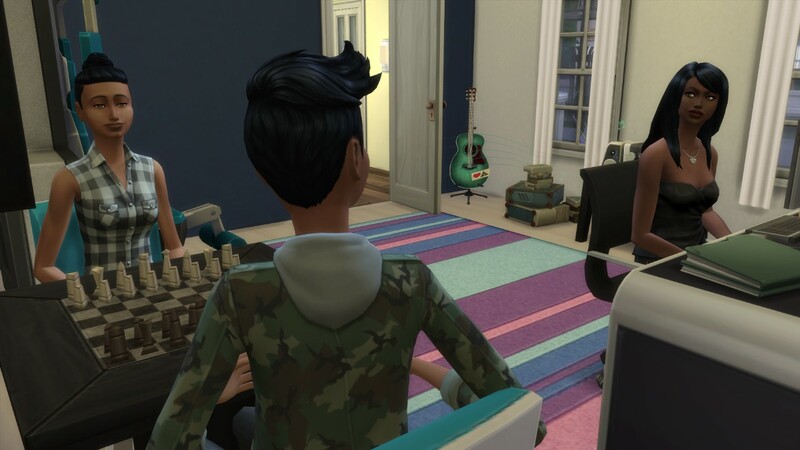 I also decided to give the living room a bit f a makeover and recoloured everything to more of a cream tone – It’s about time that Ruby and Isaac put their own stamp on the house! That’s not all though, Peter is aging up today as well! Everyone dresses up for the occasion, of course, and Isaac is as smitten with his wife as ever. The angsty teens arrive first. Oh boy, I cannot wait to have four of those in the house! The Perrins turn up shortly after. Isaac and Ruby are not paying attention though. Note: It looks like the three kids didn’t quite affect Ruby’s body the way I’d imagined. While she does seem to have some curves now, her waist looks even slimmer in comparison. Life’s unfair. Erica seems to have invited a guest of her own. Daniel cleans up nicely! Time for the first age transition of the night! Allen sure knows how to party in spite of his age! Aside from being a geek, Peter has now also become a goofball who wants to become a computer whiz… basically, he’s turning into his mom. …speaking of whom, Ruby’s now a fully mature adult. Supposedly. Those wrinkles make me sad. Time for a quick makeover me thinks. …the teens retreat to the study and play games. Peter is stoked to be the same age as his best bud Jaxen again! Erica and Cassiel just observe the boys being boys in mild amusement. What were you saying about your family Allen? Meanwhile, Erica’s crush is getting a bit emotional looking at the family graves. This is your chance to get him on his own and in a vulnerable state Erica! Come find him!